NextCut Above The Rest: Interview with classical pianist Anna Fedorova. From the outset, Portland-based Anna Tivel has been a singer songwriter with an explicit goal of telling her captive audience the stories of the lives of ordinary people. As a young girl growing up in rural northern Washington, Tivel had always been inquisitive about everything around her. And as if it was fate, the world around Anna had become her biggest inspiration, as she sort to find her place as a young woman and singer songwriter. With her fourth album Small Believer released recently, it seems unlike some musicians, she doesn’t have to fight to share her own ideas, because as listeners we are all too eager to hear what she has to say about her sobering worldview. Self-conscious, but determined, Tivel just might be the most honest musician I have come across in recent years. Her gentle acoustic guitar-driven, relatable folk musings are infectious to say the least, especially upon first hearing her distinctive raspy vocals. That said, I recently caught up with Anna to talk about her life as a musician, storytelling and her inspirations. Recently, via NPR I came across you soothing strumming guitar and infectious gentle vocals. Instantly it felt like a case of deja vu. About ten years ago, I discovered Lisa Mitchell, who would in turn become one of my favourite indie pop/ folk artists. For me, it’s easy to draw on some of the similarities between you and Mitchell. Anna, you seem to be a personal songwriter, which makes me think your music, like Mitchell’s, is a reflection of yourself and something that we can all certainly relate to. Is it fair to say that your heart is sewn on your sleeve in terms of how you approach life and music? Hadn’t heard of Lisa Mitchell and just looked her up and will be going on an exploration of her great music now, thanks:) I think heart-on-sleeve is a fair way to describe my approach to life and music for sure. I’m drawn over and over to the small stories of people (myself included) just trying to get by, to do a little better, to feel some sort of beauty in an ugly world. Those questions and images feel the most true to me, the ones that aren’t too shiny and complete. Anna, you have an incredible attachment to words and books from an early age. How much did that put you in good stead when it eventually came to songwriting or storytelling? Words have always been an escape to me, stories and poems and songs. I’m not the best at remembering concrete facts or explaining myself coherently, but I’ve always loved the way you can describe an image to get a feeling across. The smells and colors and sounds of it can be more effective than the actual event. I often feel like the world is moving too fast, too loud, too dark, but stories and songs have this way of distilling it so beautifully, breaking it down into small truths. Love, loss, life in America’s small towns and cities, relationships and spiritualism are themes that are all littered throughout your music. Do you deliberately take aim at many of these themes in your music because they are constantly present in your life? And if so, how do you take a step back from it completely consuming you? I guess writing is the only way I know to process things. There’s so much hurt everywhere and so much beauty wrapped inside of it. You could drown in heaviness if you didn’t have a way to break it down into smaller pieces, make some sense of it all. Playing shows is a very naked, vulnerable thing, and because you’re standing there singing your heart out on stage, people often feel safe sharing their hearts after the show which I’m always so grateful for. Touring is forever teaching me that the more open you are to other people, the more beautiful the world becomes. I’m a total introvert and without music, I would probably be a hermit on some hillside. It’s hard not to get swallowed whole by the news, by hard luck and ugly emotion, but somehow writing it down, trying to sing it with honestly to some simple melody makes it all feel worthwhile. Anna, can you tell us something surprising about yourself? Hmm, when I was little I dreamed of becoming an entomologist. I collected all sorts of bugs, hatched spiders in a shoebox in my bedroom, and let mosquitos bite me so I could watch how they worked. You first picked up the violin when you were a child. Can you share a wonderful memory about its effects on you? I started playing the violin because of my grandfather. He lived with us for awhile and he played the most beautiful old timey songs. My sister and I used to lay at his feet and listen. I remember his shaky hands and the green nubbly carpet we had and the warm, thin sound of those songs filling up the house. From the whimsical magic of the violin, you almost naturally progressed to the acoustic guitar. Did the guitar feel like a long lost friend at first? Do you ever wish you discovered it earlier? Guitar is still (and probably always will be) a wild mystery to me. So many strings, so many options! I wish I had started as a kid and had a whole guitar vocabulary to draw from, but I’m also pretty thankful that it still boggles my mind. I started playing guitar and writing songs at the same time and there was a real freedom to not having a clue what I was doing. On violin I’m always hard on myself because I know it well enough to know when it sounds like crap. Guitar is more like finger-painting. I have no pre-conceived notion of how it should sound, so I just let it pull me in some direction. It’s a nice headspace to be in for songwriting, non judgmental and malleable. You are friends with and part of a close community of collaborators in Portland. You have a special bond and collaborative understanding with Jeffrey Martin that as a listener I can really feel. Is it too much to ask how this came about? The Portland music community is really incredible, friendly and generous and vibrant. It seems like everyone is in everyone else’s projects, which is such a great energy to be part of. I met Jeffrey through a mutual music friend who I was playing fiddle with. He took me to one of Jeffrey’s shows at this pizza parlor in North Portland and my mind was completely blown by his songwriting. I was pretty new to writing songs and didn’t even realize they could be so powerful. We became good friends and have kind of grown into this music life together, sharing tours and ideas and respecting the hell out of each other as songwriters and as humans. He’s one of my favorite people in the whole world. Can you tell us something about the artists that inspired you to become a musician? Man, there are so many and it’s a constantly expanding thing. I grew up listening to old country with my dad and 60’s and 70’s folk with my mom, Dylan and Joan Baez. I discovered Gillian Welch and Tom Waits and Paul Simon in college and that word-loving seed inside of me just exploded. Then it was Anais Mitchell and Patty Griffin, Ryan Adams and Leonard Cohen. And John Steinbeck and Toni Morrison, Joan Didion and Annie Proulx. That’s a big list but I feel like there’s a million more novelists and poets and songwriters who get at the truth of things. Small Believer is your latest album to be released. It continues to ebb and flow with your signature style. Your gentle curiosity of life is also again on show. Where did much of this albums inspiration come from? The songs on Small Believer are all stories collected from the road and at home. I wrote them over the past year, some true, some fictional, all drawing on things I’ve seen and heard and experienced and stored inside me I guess. My good friend Austin Nevins added so much with his guitar playing and producers ear. Without him, it would be a much rougher sounding record, a lot less coherent. He’s a real dream to work with. The song Illinois stands as a wonderful opening track on your fourth album. It certainly sets the scene for the many heartfelt stories that are still to come. But if you had to pick one song from the album as your favourite, which one would it be? And why? That’s hard. Often times I feel like once the songs are out in the world, they’re not really mine anymore, they just sort of exist. I always love singing Alleyway, especially when Jeffrey sings harmonies. It feels simple, a stark story that I worked hard not to make too flowery. Blue World came out in one big glob of emotion one winter night. That one always feels good to sink into at shows. Playing shows seems to come naturally for you. What do you enjoy most about it? Standing in front of people singing songs is definitely not the most natural thing for me. If I could do it with a bag on my head, I would. I get nervous and shy and judge myself harshly, but I wouldn’t change it for the world either. I’m so incredibly grateful that people are willing to listen, to go to a place with me that is a little uncomfortable and raw. I love connecting with strangers, hearing people’s stories, breaking down my own walls over and over and being surprised by the beautiful generosity of strangers. It’s a crazy wonderful thing to be part of. Finally, what’s in store for the immediate future for Anna Tivel? I just got done with a couple months of touring for this new album and have a moment at home this winter. I’m looking forward to writing and being still, seeing friends and family, then heading out again for some time in TX and NM in January, the mid-west in February and March, CO in April, then over to Europe in the summer. 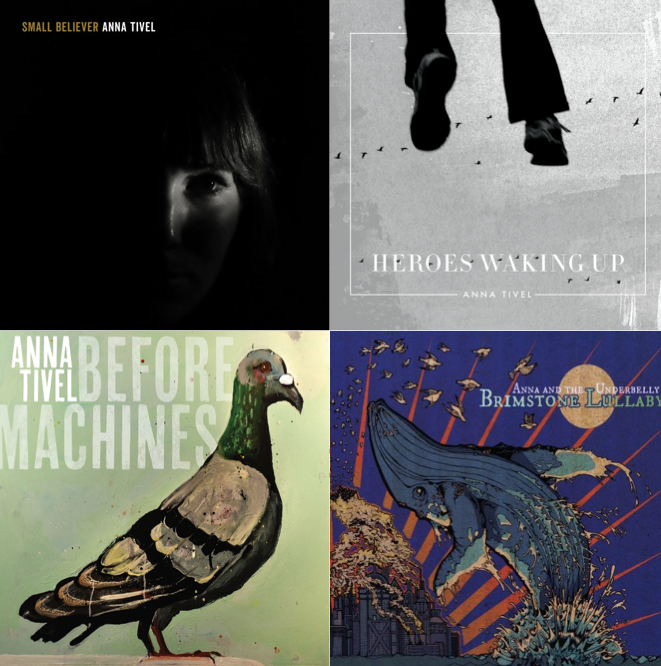 Anna Tivel’s latest album Small Believer and her back catalogue are available through Fluff & Gravy Records and iTunes. Anna’s debut album Brimstone Lullaby, under the moniker Anna and the Underbelly, is available via cdbaby and also iTunes. You can connect with Anna Tivel via her Facebook page or twitter feed @annativelmusic. You can also visit or contact Anna via her website. Watch her on You Tube. Photo credit: The header image is courtesy of Anna Tivel. It cannot be used without her expressed permission. I am not the uploader of You Tube clips embedded here.